Giorgio is a 1 year old black male born September 10, 2017. His sire is Djays Octane and his dam is Charismatic Kara. Giorgio was not individually registered and has not raced. He is good with small dogs but has not yet been tested with cats. 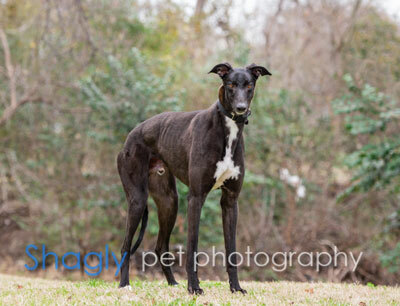 If you are looking for a handsome tuxedoed greyhound to be your shadow, Giorgio is your guy. Even though he’s a young fella, he's not very interested in toys unless you have a Swiffer…then he might artfully try to steal it away. Giorgio walks well on a leash, quickly mastered the stairs and walks on hard surfaces without fear. He is welcoming to guests both male and female and loves the attention. He is truly like a little lamb in that he is so gentle. He will take a treat very softly from our hands. When he first arrived, he located his beds immediately and doesn’t jump on people beds or sofas. He sleeps quietly through the night on his bed in our bedroom. Giorgio has learned how levered doors work, so be mindful of where you store things! The ideal home will have another canine companion or two – large or small; he does well with all dogs. He is a little vocal when he hears other dogs barking. 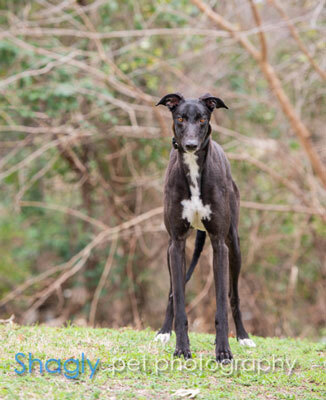 Giorgio is a smart, delightful greyhound who will make a wonderful companion for someone looking to add to their pack.